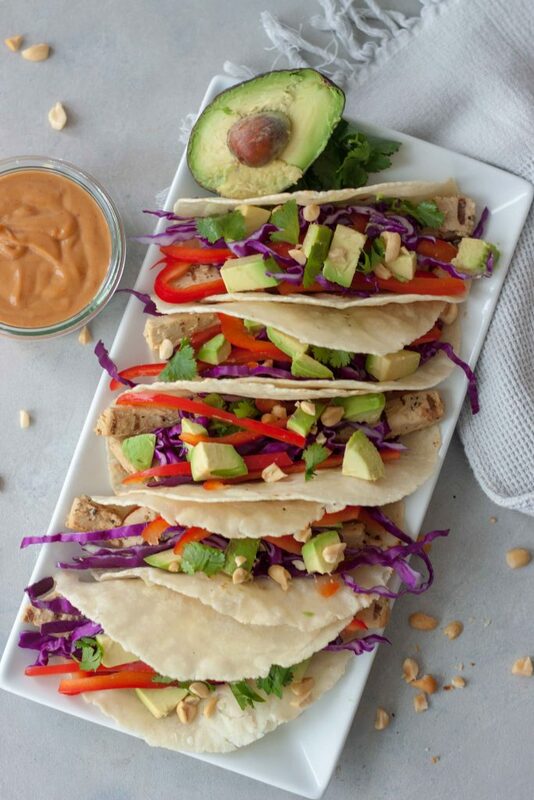 Meatless Monday, Taco Tuesday, or National Peanut Butter Day (Wednesday); any day is a good day for these Vegan Thai Tacos! 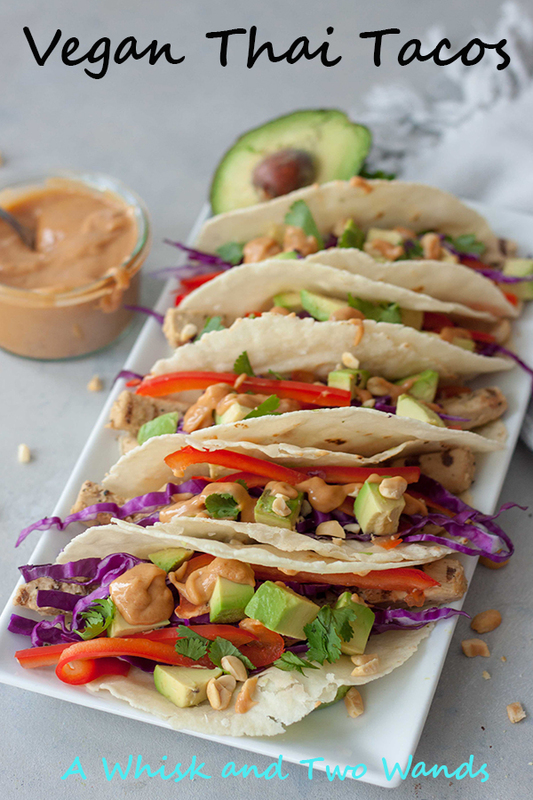 I have been so excited about these Thai Tacos I even shared a sneak peak last week. So much delicious flavor packed into them they leave me speechless, and not just because it’s rude to talk with food in my mouth. The struggle is going to be real trying to decide between my Vegan Kimichi Nachos and these Vegan Thai Tacos for Super Bowl. Combining tacos and Thai food into one is so magical it’s like a party! Flavors, texture, one bite might have you dancing. Ok so maybe the dancing is just me. Who doesn’t like tacos and peanut butter? I know it might sound strange, almost as strange as my love for peanut butter and avocado together but I always say don’t knock it until you try it and I haven’t heard anyone who has and doesn’t like it. Yep even a couple weeks ago a few people tried it after I posted it on Instagram, loved it, and were shocked. If you’re still hesitant on these just make the tacos and serve with the Thai Peanut Sauce and chopped peanuts on the side. Add them to your first bite and if it isn’t love at first bite, ok maybe second because that first might leave you like hmmm take another bite, then you still have yummy tacos for dinner. Quick and easy in less then 30 minutes you can have these ready for dinner. Chop and slice some veggies, heat up the chickenless strips in about 5 minutes, make the sauce in less then 5 minutes, heat your tortillas, fill them, and you’re done. If you want to make them even quicker you can buy shredded carrots and cabbage. I used Beyond Chicken Grilled Strips, they’re vegan and soy free, to add protein as Tuesday nights is gymnastics and soccer night but it also adds more to them then just the veggies and it’s a great combo. If you want to sub tofu you can do that. I wouldn’t sub beans or lentils in this for a plant-based protein option as it would throw off the Thai flavors going on. I used my favorite gluten free, also grain free, tortillas but you can use what you like. I like how when we heat these up they get a little crispy and hold their shape but are light and not heavy. If you are new to Meatless Monday or a plant-based lifestyle, or just looking to get your family to eat healthier this would be a great option to try. I think they would be surprised at how good they are and the delicious flavors even though they aren’t the “traditional” meat, cheese, and sour cream filled tacos. So they won’t be comparing it to a substitution for a classic they are use to. This is what’s cookin’ in my kitchen now I want to know what’s cooking in yours! 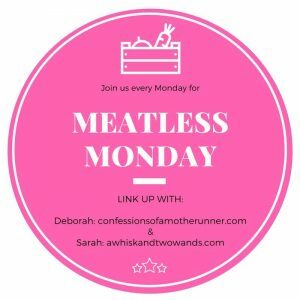 Link up with my co-host Deborah and me for Meatless Monday and share your creations below or let us know in the comments below. Looking for more Meatless inspiration check out the recipes linked up below. 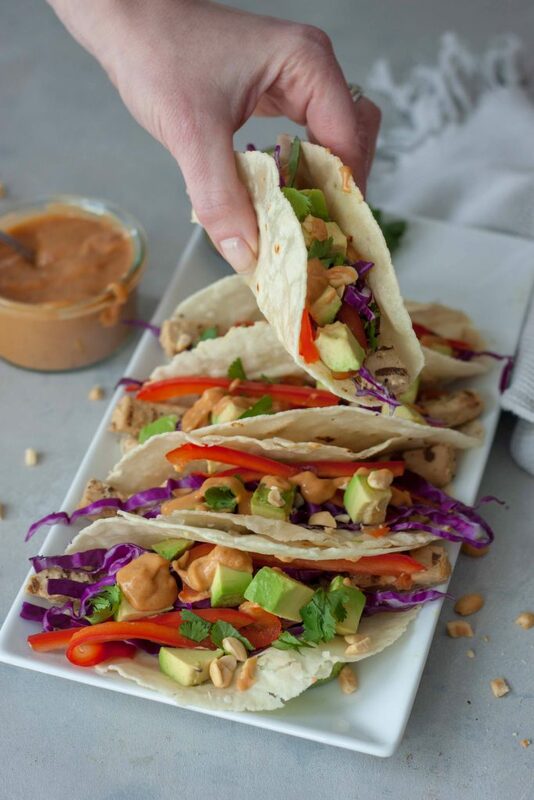 Quick and easy Vegan Thai Tacos are packed with flavor and nutrition, perfect for a weeknight dinner (Meatless Monday) or your next fiesta. Gluten free friendly. Prepare veggies as listed in the ingredients, shredded, sliced, ect. Cook vegan chicken strips per package instructions, heating in a skillet. While strips are cooking prepare the Thai Peanut Sauce. Either in the microwave or small sauce pan, mix together peanut butter, coconut milk and sugar until creamy and combine. Remove from heat and stir in liquid aminos/soy sauce. Set sauce aside. Cut avocado(s) in half, remove pit, and cut into cubes or slices. Your chickenless strips should be cooked, turn off heat and assemble tacos. If you like your tortillas warm and toasted as we do with these heat a skillet and warm tortillas for about 30 seconds per side or for ours until they start to get toasted. 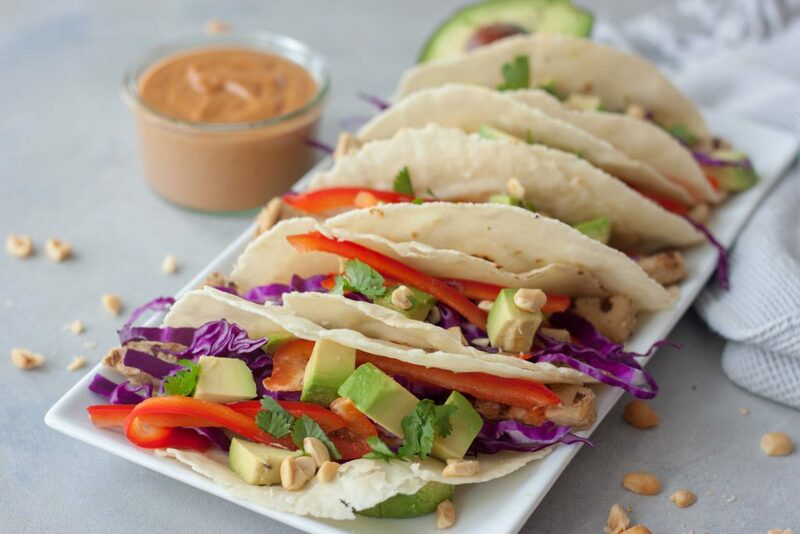 Fold your tortilla as you would a taco shell and fill with the grilled strips, shredded cabbage, shredded carrots, thinly sliced red pepper, avocado, drizzle of the Thai Peanut Sauce, chopped peanuts, and cilantro. Or you can assemble and serve with the Thai Peanut Sauce on the side. Or you can sub Peanut Butter & Co The Heat Is On for pb and omit the chili sauce. They’re so good, wish you could come over and enjoy some the next time I make them! 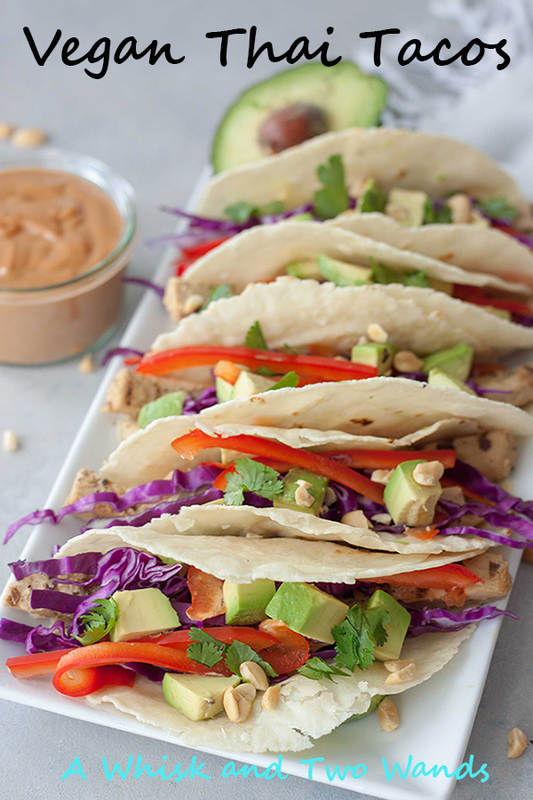 Mmm I’m always down for tofu tacos! These look awesome and definitely will be making an appearance at my next taco night! These are Beyond Meat, soy free, although you can sub tofu. Hope you enjoy them! Yes! I think I’m going to have peanut butter for every single meal! Ok, I thought I was the only odd ball that likes avocado and Peanut butter together! 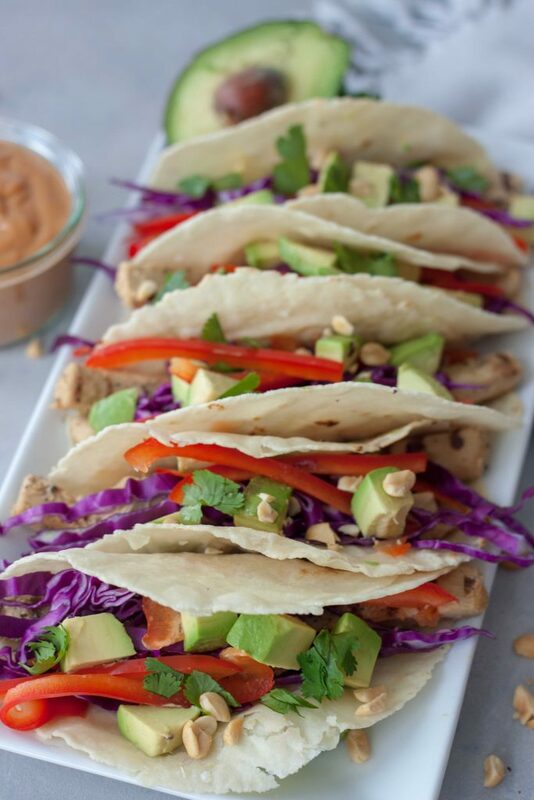 These tacos sound amazing, from the filling to the sauce! Nope it’s one of my favorite combos!! You had me at tacos, and then dang girl, the Thai addition, WINNING! Can I join you for Taco Tuesday tomorrow?! I’ll make these any day you want to come over! These look so delicious! Love tacos and love that these are Vegan. Perfect for my taco loving hubs! Thank you, they’re so full of flavor I think he’d enjoy them! Although depending on how adventurous he is might give you a funny look with the peanut butter. These tacos sound delicious! Ever since I visited Thailand a bunch of years ago, I’ve loved Thai food – but sometimes I think it’s not so easy to find vegetarian Thai food out (ya know, that sneaky fish sauce pops up everywhere!). And I’m with you, I’m a fan of peanut sauce. And avocado. And tacos! I hear you, this is just peanut butter, coconut milk, small amount of sweetener and garlic chili for some heat although there is a spicy peanut butter I use sometimes and omit the additional heat. So I’ve been kinda obsessed with Thai everything and taco everything lately which means I need these in my life STAT. Sounds like you do! Enjoy and keep me posted! Thank you, I’m right there with you which is why I had to put them together! These sound (and look!) amazing! Thai food is deeeelish! They’re so good and the tortillas are my fav lately, almond flour tortillas! 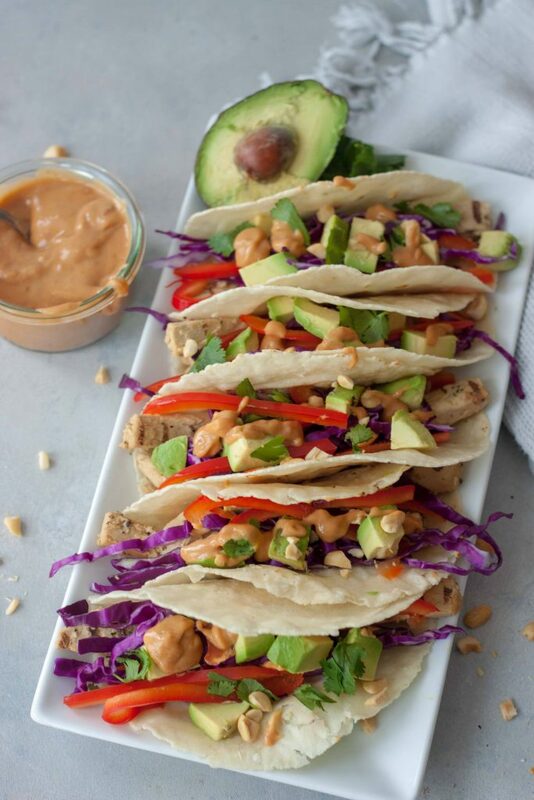 These vegan Thai tacos are a great addition to Meatless Monday! Love how easy they are to make! Thank you Jessica, pretty much any night is a good night to make them! Ok. I looooove tacos and these look unreal. I have never had vegan tacos before. If you do eat meat you could sub chicken for the Beyond Chicken Strips, or try them as is for a Meatless Monday option! Who knew there was a way to combine my two favorite foods? Taco Tuesday is gonna be sooo good! Two of my favs too and I couldn’t be happier with how they turned out! I can’t stop making them, or versions of them. I’ll say, I’m intrigued. Definitely pinning for later. I’ve been wondering what the “meat” is for this recipe after seeing the photo on FB. I’ve never tried Beyond Chicken. I’ll have to look into it. jill conyers recently posted…What Are the Benefits of Exercise? It’s like tofu but has a firm texture and it’s gluten free and soy free, you’ll have to check it out! That peanut sauce on top looks insanely good!! I think I know what today’s taco tuesday meal will be! It’s so good I could probably just eat a whole head of cabbage or a bunch of carrots with it! These look almost too pretty to eat!! I just love the colors here and I am a huge fan of Thai anything, so I can’t wait to try this!! Almost but they’re so good I can’t stop! Hope you enjoy them as much as we do! Oh my! All the flavors in this sound amazing. Would have never thought off putting peanut butter and avocado together. But I’m thinking it would totally work. Combining tacos and thai food is a genuis idea! Can’t wait to try these for #tacotuesday! Thank you Emily, hope you enjoy them! Hi! We’re doing Thai Taco theme for our wedding. What kind of side dishes do you think would be fun to serve alongside this taco recipe? We’re having a 100% vegan wedding and figured our theme would be tasty for everyone.